Trade name Shimane Kubota Iron Works. Co., Ltd.
-Cutting and assembling of vital parts such as linkages, ball joints, lower arms, and sockets. -Cutting of pinion housings, shift forks, thermo-cover clutch levers etc. Main customers Kubota Iron Works Co., Ltd.
Fuji Kouatsu Flexible Horse Co., Ltd.
1972 (May) The company was established. 1980 (August) Started business with TRW Automotive Japan Corporation(TAJ). 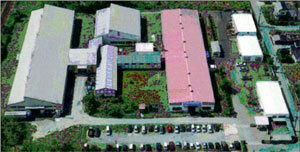 1998 (May) Expanded the plant(660 ) and started the assembly of linkages. ball joints etc.